Kyle Nielsen is a multi-instrumental musician whose primary instruments are guitar and vocals. 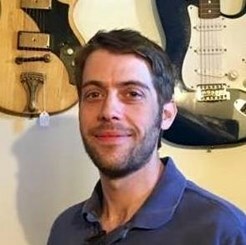 Using a wide range of musical styles, Kyle has been playing guitar, singing, and recording music for 20 years, as well as 15 years of playing bass and piano/keyboards. He has an A.A.A.S. degree in Music Technology: Digital Audio Engineering from Shoreline Community College, where he also completed two years of classical music theory and ear training. Kyle loves performing live and has performed in live shows with several bands, including his own band, Luxe Canyon. As Luxe Canyon, Kyle wrote, performed, engineered, and mixed a full-length album by himself, which was released on iTunes, Spotify, Youtube, and everywhere else you find music online. On the side, he works as a freelance audio engineer and graphic/web designer. Kyle's teaching style is all about having fun with music. He believes that music is a way of tapping into your creativity and sense of wonder, revealing an endless landscape of complex emotions and ideas. Request Lessons with Kyle today!